CITY BUZZING WITH ACTIVITY . THE BEE IS AN EMBLEM OF MANCHESTER, and symbolises activity and industriousness. Well there's plenty of that going on in Manchester at the moment, with lots of exciting new developments happening now or very soon. Dumplington, alias the Trafford Centre is highlighted in all the media - the controversial shopping centre opens on Thursday - Your Eyewitness in Manchester will be getting a sneak preview on Wednesday, though I must admit to having mixed feelings about the place. At this moment ISEA, www.isea98.org, the International Symposium on Electronic Art is in progress, taking place simultaneously in Liverpool and Manchester. This weekend, the In The City festival gets underway with 500 bands at 50 venues. I've been working on the Manchester Online In The City website, which should be ready in the next couple of days. Tomorrow, a new radio station for the North West is officially launched - Century 105 has been broadcasting test transmissions for several weeks already. 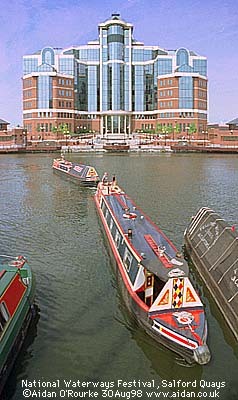 They're based in Salford Quays. The Castlefield Festival will also be taking place this weekend, and in October, there will be a food festival entitled "Munchfest". The weekend before last, we had the National Waterways Festival, picture right. I've got enough on my plate at the moment, so I'll move on swiftly to other topics. THE BURNING QUESTION OF THE MOMENT is the possible purchase of Manchester United by Rupert Murdoch for £575m. Fans gathered at the ground this morning, and the mood is definitely negative. Also featuring nationwide is the disturbing story of the family doctor Harold Shipman of Roe Cross, Mottram, Tameside, who was arrested in connection with a number of deaths and has been charged with the murder of an 81 year old woman. He'll be appearing at Tameside Magistrate's court. NORMAL SCOULAR, of Bramhall, was on board the Swissair MD-11 which crashed into the sea off Canada last week. He was a high-flying businessman, group chief executive of Sylvania Lighting plc. His family described how they were first of all informed that he wasn't on board, only to be told later that he was among the victims. It's a nightmare that must cross the minds of all those who travel by air, including many readers of this page, I expect. Flying is the safest form of transport, but it's chilling that such accidents can still take place. I look forward to a time when air disasters are a thing of the past. In the meantime, there's one form of international communication that's safe - the Internet. THE UNCERTAINTY ABOUT THE stadium for the 2002 Commonwealth Stadium is at an end - it was announced last week that the multi-million pound building will go ahead, and it won't be a temporary structure, as had been feared. After the games, it's planned that Manchester City will move in, subject to consultations. The east Manchester Commonwealth Games site is currently lying empty, with wire netting fences around it. The only facility already in place is the Manchester Velodrome, pictured here. TYPICAL ISN'T IT, after months of clouds and rain, or so it seemed, now that we're on the road to Autumn, the weather bucks up. Today it was sunny and mild, especially in the earlier part of the day. By late afternoon, it was cloudier, but it continues to be mild. Current EWM temperature is 61/16 degrees. Hi Aidan , I too look back to the times past when I lived in Swinton so any old photographs are appreciated . I remember going to Tatton Park but cannot recall the mansion interior . Any chance of photographs of the inside ? Unfortunately, the National Trust don't allow photographs of the interiors of their houses, not even to National Trust members, like myself. They do allow it for special purposes and by prior arrangement - I hope to photograph interiors some time soon. 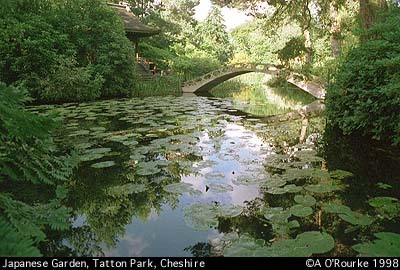 In the meantime, here's one of the Japanese garden at Tatton Park.